These are the essential must have’s as far as equipment goes if you are just getting into the sport of paintballYou could always splurge and buy everything you see that other paintballers have at your local paintball field, but that’s not necessary. There really are only a couple of things you need to have in order to play paintball, the rest is just extra. The type of paintball gun you get is up to you. You can go cheap, mechanical, expensive, reliable, electronic, its all up to you. Just be sure you do your research first and know what you buying. If you’ve never owned a paintball gun before in your life, then your best bet is to get a reliable paintball gun, like a Tippmann 98. Check out our Paintball Guns section for more info on other paintball guns. Most paintball guns can use both of these air sources, Co2 and High Pressure Air. Some however only use Co2, and others work best on HPA, which generally are the more expensive paintball guns. A general rule is if your paintball gun is cheap or mechanical then it uses Co2, if its expensive you are going to want to use HPA. HPA tanks are expensive and cost often over $100. Co2 tanks cost anywhere from $9 to $25. If you get a Co2 tank you are going to want to get a 16oz or a 20oz because they offer the most shots which means less filling on your part. The same goes for HPA tanks, grab a larger tank like a 68ci 4500psi HPA tank. HPA tanks are sometimes labeled as Nitrogen tanks, so don’t get confused, they are the same thing (Nitrogen and Compressed Air are used to fill HPA tanks). Hopper or Loader, they are the same thing. Depending on your budget you can splurge and get an electronic hopper or stick with a gravity feed hopper. People get electronic hoppers because they feed faster than gravity hoppers, which results in fewer broken paintballs and no misfires (when a paintball is not fired from the paintball gun). Most electronic hoppers feed 15+ bps (balls per second – the rate at which a ball is fed), which is plenty fast for a mechanical paintball gun. If batteries aren’t your thing then you might want to find yourself a gravity feed hopper that feeds 11 + bps, which relies on just gravity and is cheaper than an electronic hopper. It also is fast enough for most mechanical paintball guns. This is essential, as it protects your face, more importantly your eyes. There are two ways you can go with a paintball mask, you can go cheap and get a mask that has a single pane lens, or fork out a little more and get a thermal lens that won’t fog up as easily. 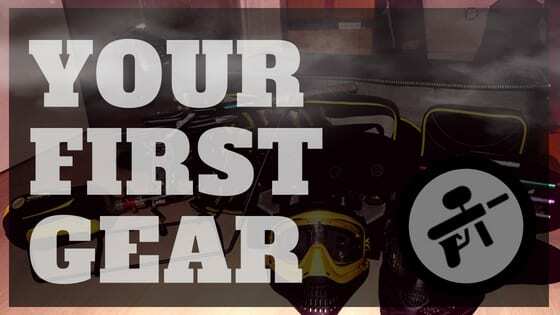 Masks fog up when it is humid or the temperature on the inside of your mask is cooler than the outside air. The heat of your breathe can cause condensation on the lens, but with a thermal lens this happens less frequently. Paintball masks can cost anywhere from $15 to $70 depending on the level of quality. So all in all there are 4 things you need to get into paintball. Of course there are other things you can get, but they aren’t mandatory. Things like a pod pack, barrel swab, or other paintball gear. You can get by without those things and get them later if you want to step up your game.